Visual artists Anne Cleary and Denis Connolly discuss the inspiration behind their recently completed artwork Run River Run for the new 75 bed ward at University Hospital Galway and how the initial challenges of a collaborative approach to creating public artworks led to rewarding avenues of exploration. Escape is perhaps the first thing that comes to many people’s minds when they find themselves in hospital. To be in hospital means that we are less well than we have been at other times of our life, and so naturally it is a place where we don’t want to be. We wonder how long we will “be in,” we wait for test results or for the visit of a specialist. Time is heavy in a hospital. 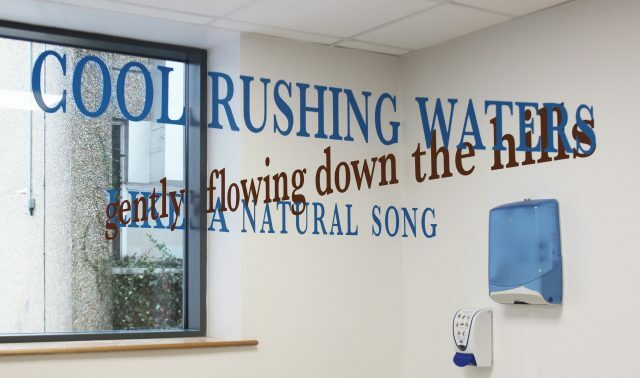 When we were commissioned to produce a series of permanent, participative artworks for the new ward at University Hospital Galway, the theme of rivers was chosen through an online consultation with staff in conjunction with the naming of the wards. We found this strange at the time. We were unused to the idea that other people, and not the artists, would choose the content of a work of art. However, we were happy to go along with this suggestion by Galway University Hospitals Arts Trust and HSE Estates to see where it would lead the project. Several themes were originally suggested: literary, poetic, names of famous people or significant events in Galway’s history, as well as themes from the natural world – mountains, rivers and trees. 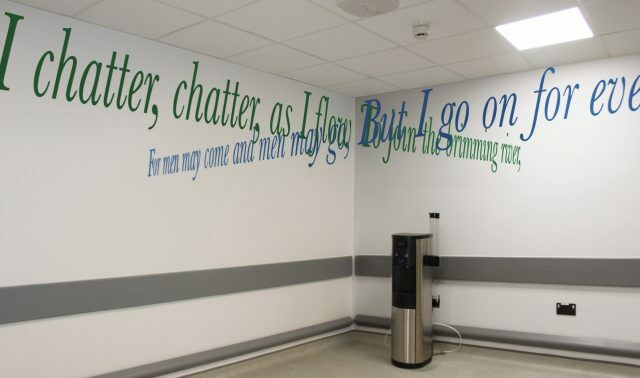 Admittedly, when the “rivers” theme was chosen by hospital staff this was, at first, difficult for us: we had been hoping for a literary theme. But looking back, the staff had the right instinct. People like rivers. The depth of meaning that rivers carry for people is extremely profound and culturally wide-ranging; touching people from all backgrounds, cultures, and creeds. The image of a river, or the sound of its name, conjures up a wealth of associations in our minds, which can range from a favorite song, to a story told of a far away place, to a childhood memory or a dream of the future. Rivers have the propensity to create imaginary lines of escape, leading our thoughts away from the here and now across time and space to other places and other times. A name like “Euphrates” brings you not just to another place, but to another time. In fact, it evokes a whole civilisation that is caught up in the freshwater flow. You could say the same of the names “Shannon” or “Delaware” or “Volga”, but how different the places you are brought to when you summon up these names. Clearly, river names offer powerful lines of escape that break through cultural, geographical and even historical frontiers. If these lines can be broad and bold, they can also be soft and delicate: how far away does the name “Corrib” bring us? In order to understand what rivers meant to the specific community of people using University Hospital Galway we spent a week in the hospital foyer talking to people. We asked them to share something about a river with us. We tried to be as non-prescriptive as possible, so that people would feel comfortable sharing whatever came to mind. This was a crucial week in the project. We talked to people of all ages: older people who shared memories, children who made word games, those who shared a line from a favorite book or song, or who spontaneously composed a line of poetry. All through the summer, people continued to email fragments of poems or songs about rivers to us, and we realised that the project had touched people in a way that we weren’t expecting. It was clear that all these images, memories and songs represented mental lines of escape for people, ways of leaving worry and anxiety behind and going somewhere else on an imaginative level for a short space of time. We wanted to find a way of expressing this in the form of the work. We came up with the idea of setting some of these words out in strong lines of perspective, using a technique derived from the Renaissance called “Quadratura”. Painting was often integral to architectural interiors during the Renaissance. Quadratura[ii] uses perspective techniques to create a physical dialogue between painting and architecture, bringing the architecture into the painting. Baroque painters would take this a step further and allow the painting to break out of its frame and become part of the architecture. But how could this great art historical marriage of fresco and carved stone be adapted to a world of concrete and glass? This was an essential question for us in the development of this work. We turned to a technique that is a contemporary development of Renaissance Quadratura. “Anamorphosis” allows a figure to be projected onto different surfaces of an interior in distorted form and yet the figure appears undistorted from a particular vantage point. 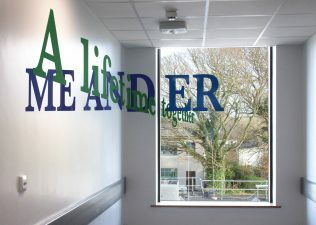 Our aim was to create anamorphic compositions that draw the eye beyond the limits of the rectilinear interiors of the hospital building, while the words themselves draw the mind to other places. From the beginning, our project was made only of words. Each composition (there are 18 in total) is a strong line of words evoking rivers. Some appear to continue straight on where a corridor ends or turns. Some begin on an interior wall and then appear to continue on out the window. Some create an intersection of two lines of text that mingle where two planes come together. In each case, there is a point of view where the composition comes together, though this does not mean that it is incomprehensible from other points of view. Rather than indicate the point of view, which we felt would be a little didactic, we would leave it open for people to find it naturally in their exploration of the work. People in hospitals will see the same corridor or the same window or the same corner many times, and we wanted to leave room for the surprise and delight of discovering that something you have seen many times is only now delivering all its secrets. Our objective was to create imaginary lines of escape for people, inviting them to distance themselves from the worry of their medical condition. How successful we have been in this aim we don’t yet know. The first ward, the Shannon Ward, has opened recently, and the two other wards are programmed to open later in 2017. Once the building is operational we hope to spend some time evaluating the project and gathering feedback from staff, patients and families. Making artwork for a hospital is a hugely challenging proposition. The artist’s ambitions for the work, the desire to somehow imbue the art with healing powers or to imagine other significant roles for the art within a healthcare environment can run full tilt into very complex human, administrative and logistic problems. Over the course of its making, Run River Run developed in a similar manner to the way a waterway might; a tiny spring of an idea given by the staff became a flood of ideas, and obstacles that we met along the way gave the project its form, in the same way as a river might develop a sinuous form as it skirts mountains on its path. [i] From Alfred, Lord Tennyson’s poem “The Brook,” originally published in Enoch Arden and Other Poems (1864). [ii] Quadratura is a term used to describe a type of illusionistic mural painting in which images of architectural features are painted onto two-dimensional surfaces using perspective techniques to create the illusion of a three-dimensional space. The real architecture of the room appears to extend into an imaginary space beyond the confines of the actual ceiling or wall. 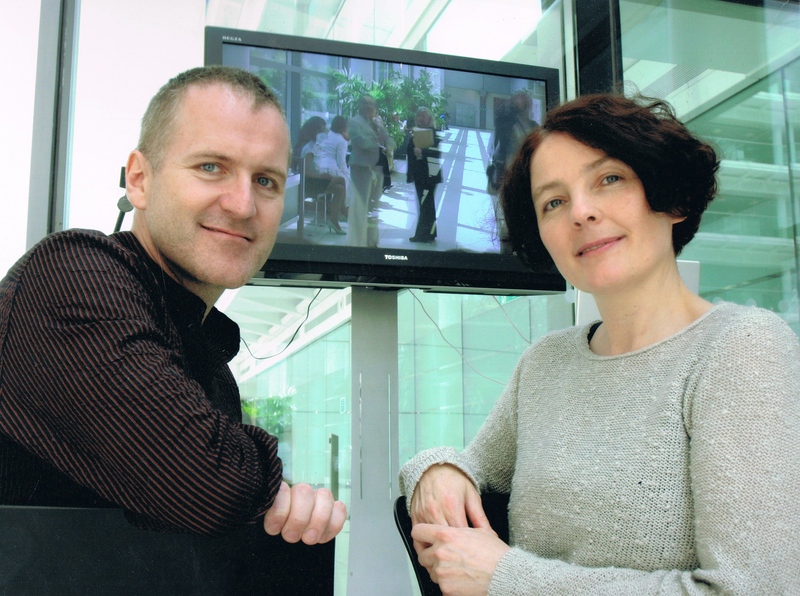 Award-winning artists Anne Cleary and Denis Connolly live and work between Paris and Ireland. They are particularly interested in how art relates to people, and use a variety of media, including print, paint, photography, sculpture and light to explore this relationship. They create site-specific commissioned artworks that often engage with architecture and place, including the Pompidou Centre, Paris (2009); The Barbican, London (2010); the Casino, Dublin (2013); the Dead Zoo, Dublin (2014); the Marconi Station, Clifden (2016) and the German Gymnasium, London (2016). Our objective was to create imaginary lines of escape for people, inviting them to distance themselves from the worry of their medical condition.